مشکور, مهرداد, رحیم نژاد, مصطفی, مشکور, مهدی. (1397). بهبود عملکرد پیل سوختی میکروبی با ساخت نانوکامپوزیت زیستی سلولزی به عنوان الکترود آند. نشریه شیمی و مهندسی شیمی ایران, 37(1), 105-112. مهرداد مشکور; مصطفی رحیم نژاد; مهدی مشکور. "بهبود عملکرد پیل سوختی میکروبی با ساخت نانوکامپوزیت زیستی سلولزی به عنوان الکترود آند". نشریه شیمی و مهندسی شیمی ایران, 37, 1, 1397, 105-112. مشکور, مهرداد, رحیم نژاد, مصطفی, مشکور, مهدی. (1397). 'بهبود عملکرد پیل سوختی میکروبی با ساخت نانوکامپوزیت زیستی سلولزی به عنوان الکترود آند', نشریه شیمی و مهندسی شیمی ایران, 37(1), pp. 105-112. مشکور, مهرداد, رحیم نژاد, مصطفی, مشکور, مهدی. بهبود عملکرد پیل سوختی میکروبی با ساخت نانوکامپوزیت زیستی سلولزی به عنوان الکترود آند. نشریه شیمی و مهندسی شیمی ایران, 1397; 37(1): 105-112. پیل سوختی میکروبی یکی از منابع تجدیدپذیر انرژی می­ باشد که در آن میکروارگانیسم­ ها نقش زیست کاتالیستی در واکنش ­های اکسایش و کاهش یک سوبسترا مانند گلوکز را برعهده دارند. از اجزای اصلی در پیل سوختی میکروبی الکترودها هستند. 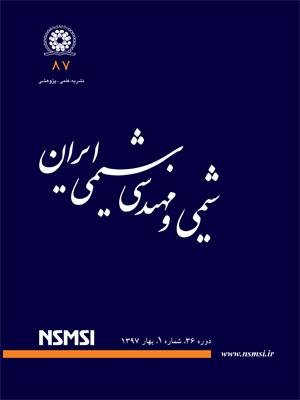 در این پژوهش یک الکترود آند نانوکامپوزیت زیستی متخلخل با بستر سلولز باکتریایی و فاز پراکندهپلی­آنیلین به­ صورت هیدروژل ساخته ­شد. برای سنتز این الکترود از روش پلیمریزاسیون اکسایشی شیمیایی درجا در 4 غلظت­ گوناگون از مونومر آنیلین بر روی سلولز باکتریایی استفاده شد. درستی سنتر با آنالیز FT-IR و عکس برداری FE-SEM بررسی شد. عملکرد آند یاد شده در پیل سوختی میکروبی در حضور مخلوطی از میکروارگانیسم­ ها مورد بررسی قرار گرفت. مقاومت الکترودهای ساخته شده و توان و جریان تولیدی پیل در حضور این الکترود ها اندازه گیری شد. در بیش ­ترین غلظت به­کاررفته از مونومر آنیلین در فرایند ساخت الکترود دانسیته توان 3mW/m 375 و دانسیته جریان 2mA/m603 به ­دست آمد. Rahimnejad M., Ghoreyshi A.A., Najafpour G., Jafary T., Power Generation from Organic Substrate in Batch and Continuous Flow Microbial Fuel Cell Operations. Appl. Energy. 88(11): 3999-4004 (2011). Hassan S.H., El-Rab S.M.G., Rahimnejad M., Ghasemi M., Joo J.-H., Sik-Ok Y., Kim I.S., Oh S.-E., Electricity Generation from Rice Straw Using a Microbial Fuel Cell. Int. J. Hydrogen Energy. 39(17): 9490-9496 (2014). Mashkour M., Rahimnejad M., Effect of Various Carbon-Based Cathode Electrodes on the Performance of Microbial Fuel Cell. Biofuel Res. J., 2(4): 296-300 (2015). Rahimnejad M., Adhami A., Darvari S., Zirepour A., Oh S.-E., Microbial Fuel Cell as New Technology for Bioelectricity Generation: A Review, AEJ., 54(3): 745-756 (2015). He C.-S., Mu Z.-X., Yang H.-Y., Wang Y.-Z., Mu Y., Yu H.-Q., Electron Acceptors for Energy Generation in Microbial Fuel Cells Fed with Wastewaters: A Mini-Review, Chemosphere. 140: 12-17 (2015). Zhou M., Chi M., Luo J., He H., Jin T., An Overview of Electrode Materials in Microbial Fuel Cells. J. Power Sources. 196(10): 4427-4435 (2011). Hindatu Y., Annuar, M., Gumel A., Mini-Review: Anode Modification for Improved Performance of Microbial Fuel Cell. Renewable Sustainable Energy Rev., 73: 236-248 (2017). Yazdi A.A., D’Angelo L., Omer N., Windiasti G., Lu X., Xu J., Carbon Nanotube Modification of Microbial Fuel Cell Electrodes, Biosens. Bioelectron.. 85: 536-552 (2016). ElMekawy A., Hegab H.M., Losic D., Saint C.P., Pant D., Applications of Graphene in Microbial Fuel Cells: The Gap Between Promise and Reality, Renewable Sustainable Energy Rev., 72: 1389-1403 (2017). Mashkour M., Kimura T., Kimura F., Mashkour M., Tajvidi M., Tunable Self-Assembly of Cellulose Nanowhiskers and Polyvinyl Alcohol Chains Induced by Surface Tension Torque. Biomacromolecules. 15(1): 60-65 (2013). خواجوی ر،. مفتاحی ا،. اصفهانی ا.ج،. ستاری م،. سنتز سلولز میکروبی از سویه بومی و بررسی شبکه نانو الیافی به دست آمده از ساکاریدهای گوناگون، نشریه شیمی و مهندسی شیمی ایران، (3)31: 79 تا 93 (1391). Mashkour M., Moradabadi Z., Khazaeian A., Physical and Tensile Properties of Epoxy Laminated Magnetic Bacterial Cellulose Nanocomposite Films. J. Appl. Polym. Sci., 134(30):1-7 (2017). Kim Y.H., Park S., Won K., Kim H.J., Lee S.H., Bacterial Cellulose–Carbon Nanotube Composite as a Biocompatible Electrode for the Direct Electron Transfer of Glucose Oxidase. J. Chem. Technol. Biotechnol., 88(6): 1067-1070 (2013). Shi Z., Zang S., Jiang F., Huang L., Lu D., Ma Y., Yang G., In Situ Nano-Assembly of Bacterial Cellulose–Polyaniline Composites. RSC Adv., 2(3): 1040-1046 (2012). Zou L., Qiao Y., Zhong C., Li C.M., Enabling Fast Electron Transfer Through Both Bacterial Outer-Membrane Redox Centers and Endogenous Electron Mediators by Polyaniline Hybridized Large-Mesoporous Carbon Anode for High-Performance Microbial Fuel Cells. Electrochim. Acta., 229: 31-38 (2017). Baker C.O., Huang X., Nelson W., Kaner R.B., Polyaniline Nanofibers: Broadening Applications for Conducting Polymers. Chem. Soc. Rev., 46(5): 1510-1525 (2017). Marins J.A., Soares B.G., Dahmouche K., Ribeiro S.J., Barud H., Bonemer D., Structure and Properties of Conducting Bacterial Cellulose-Polyaniline Nanocomposites, Cellulose,18(5): 1285-1294 (2011). Lee B.-H., Kim H.-J., Yang H.-S., Polymerization of Aniline on Bacterial Cellulose and Characterization of Bacterial Cellulose/Polyaniline Nanocomposite Films, Curr. Appl Phys., 12(1): 75-80 (2012). Müller D., Mandelli J., Marins J., Soares B., Porto L., Rambo C., Barra G., Electrically Conducting Nanocomposites: Preparation and Properties of Polyaniline (PAni)-Coated Bacterial Cellulose Nanofibers (BC), Cellulose, 19(5): 1645-1654 (2012). Lee H.-J., Chung T.-J., Kwon H.-J., Kim H.-J., Tze W.T.Y., Fabrication and Evaluation of Bacterial Cellulose-Polyaniline Composites by Interfacial Polymerization, Cellulose, 19(4): 1251-1258 (2012). Wang H., Bian L., Zhou P., Tang J., Tang W., Core–Sheath Structured Bacterial Cellulose/Polypyrrole Nanocomposites with Excellent Conductivity as Supercapacitors, J. Mater. Chem. A., 1(3): 578-584 (2013).